West of N.H. Route 10, one-half mile southwest of Westport Village on Old Westport Road over the Ashuelot River in the town of Winchester. The bridge has a length of 106'6" with a clear span of 101'9". It has an overall width of 17'8" with a roadway width of 14'3", and a maximum vertical clearance of 11'0". The abutments are unmortared stone. The bridge is posted for six tons. The bridge was named after its original builder and owner, Anthony Coombs. The Coombs Bridge once played an important role in both the social and commercial development of the area. Although it is not a necessary transportation link today, it is still convenient to students and tourists near N.H. Route 10. Extensive repairs were made by the town in 1964 and the bridge was reopened the same year. The bridge was rehabilitated in 1971 at a cost of $13,340. Today, the bridge is in need of major repairs. In 1984, state officials recommended bypassing the bridge using existing town roads. Such a bypass would require significant improvements to local gravel roads in both Winchester and Swanzey and would result in a considerable detour for residents of this section of both communities. 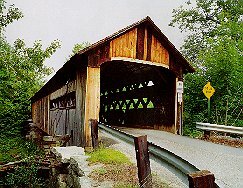 The Coombs Bridge is listed on the National Register of Historic Places.